This is a Metro looking starting screen, and it took me probably 15 seconds to figure out where I was supposed to click to install the toolset. First issue: What’s with all the red? This means I should be paying attention to something, right? Second issue: What the heck is this screen? I was expecting a standard install screen. Third issue: Now what? What am I supposed to do? The icons are meaningless to me. Oh wait, maybe I should read that teansie-weansie text for each of the boxes. Fourth issue: Ah, there is “Install” in a tiny font. Really, just because Microsoft says “Metro” doesn’t mean we all need to jump like automatons, does it? And if you think Metro is the right way to go, please, please, design something that actually is intuitive. 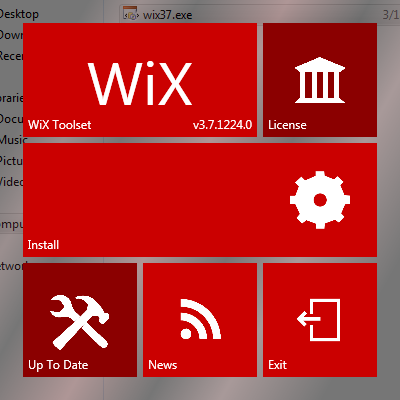 The entry on my Window’s taskbar shows an icon that I can only assume is from Wix with no text. That’s helpful. The installation starts with a spinning “gear” – I have no idea what it’s doing. A lot of meaningless file information eventually flashes by, too fast to read, too long to fit on the screen. After it’s completed, the first screenshot still stays there. Now what? I guess I should click on “Exit”? The summer edition of Lilipoh magazine (Issue 64, Vol. 16, Summer 2011) published an article by Seth Jordan, “It’s not what we know that’s important, it’s what we don’t.” You can read the full article on the ThinkOutWord website here. What follows is a critique of that article. Reading Seth’s article, my first response is, why is this article written with such strong emotion? By all appearances there are some strong feelings here, and I am greatly puzzled as to their source. On the one hand, I could simply pass it off as a writing style. On the other hand, it could really represent Seth’s inner feeling life regarding his views on the relationship between youth and adults, education, etc. Regardless, I personally struggled with seeing past the emotional thinking so that I could get to the underlying reasoning. What follows here is a critique of the reasoning. My motivation for doing this is fairly straight forward—to provide some feedback to the community from the perspective of one of the “adults” that Seth speaks of. I think it’s pretty clear that most “adults” have no idea what to do with “young adults.”After years of pushing us through school, we come out the other end and don’t really know much and aren’t very productive. It takes years for us to settle into jobs, to forget the anguish and idealism of our youth, and to raise families of our own. But those years are an awkward state of limbo – we bumble around and wander and can’t seem to find our place in society. The article begins with the premise that older adults are disconnected from young adults and that young adults are themselves disconnected from the parental and societal agendas of education and work. In Seth’s emotional thinking, he views adults as “pushing” young adults through school and concludes that young adults, at the end of this process are intellectually (and perhaps emotionally?) unprepared and therefore also not able to be productive. The premise is that youth involves feelings of anguish and idealistic thinking which takes years “to forget,” and that transition (into the same disconnected adults, I wonder?) occurs in an “awkward state of limbo” in an attempt to reconnect to society. I have a friend, Annie, who is 24. She is the Director of Development for an organization that works with colleges and universities to promote moral and ethical investments for their endowment funds. She works with youth in colleges to promote education and activism, and with senior decision makers that control the financial decisions. She was specifically hired by the management of this organization for her creativity, her energy, her new ideas. This is, in many ways, her dream job because she isn’t just working “in the system” (her previous job was determining how the Department of Social Services funding should be distributed within the legal confines of Federal and state laws), she is instead able to be creative in the private sector. There’s a creative source to every human being. We each bring new impulses, new gifts, new talents into the world that the world has never before seen. These of course need to be developed and honed, just as any rich natural resource must be taken up and crafted in order to have an “economic value” (in order to become food, shelter, clothing, or an iPod). But the resources are all there… we’re just waiting to be recognized. As the author Alain de Botton has stated: “We talk of waste all the time. Of course the one resource that we continue to waste in prodigious quantities is human life, our own and those of others. We certainly might hope that in the 21st century we’ll get cleverer at managing to extract from people those talents which they themselves are not aware of, and which we all struggle to get a grip on…” Human capital is our greatest waste, especially the never-before-seen splendors of the young. There’s a source of creativity in every human from which stems “new impulses, new gifts, new talents,” which need to be “developed and honed”, and which is being wasted. Seth makes a false analogy between natural resources and “young adults” when he writes “But the resources are all there..we’re just waiting to be recognized.” Gold is gold regardless of where it is dug up. The “gold” of each human being is unique. When Craig Holdridge, at my son’s high school graduation, said (and I paraphrase) “education should not be designed to prepare our children for the world, but rather so that the world is unprepared for our children,” I see him recognizing the potential (or as Seth puts it, the “resources”) of young adults. There is also something of a two way street here—if you want to be recognized, then demonstrate that you bring forth these new impulses—be worthy of that recognition. Yes, I look at an infant and recognize the incredible potential of that infant. When I see a 30 year old, I still see the potential, but that 30 year old has a fully developed ego body by this point and so I also look to see how, through his/her own will forces, that person is bringing his/her own new impulses, gifts, and talents “into the world.” When does a young adult say “ok, I’m going to overcome the dramas of my childhood, stop being fettered by the past, and take responsibility for becoming the fully incarnated human being that I have the potential of becoming?” I would like to ask Seth, when do you become responsible for garnering the recognition that you seek? What keeps us from recognizing and developing the gifts of youth for the benefit of all? First: we’re looking for the wrong things in young people. We value information – the right answers to our problems. Often what young people bring are the right questions. Our power is not in what we know, but what we don’t (and can imagine). Here’s an example from my own life: recently I met with an expert in my field of interest (activism and the social sciences, with a focus on the radical ideas of the 20th century Austrian philosopher Rudolf Steiner). I asked him about bringing health to society through these extraordinary ideas – what’s already happening and what’s possible? The answer was discouraging: he knew everything that was happening, including the amazing forces of opposition arrayed against any sort of change in the status quo, and saw little hope. I sat there in his office and realized that, because he knew everything about the past, he was unable to imagine the future – the unknown, the impossible – and so was stuck. I sat across from him, a fire in my belly that he knew nothing of, and knew that he had no idea how much I didn’t know, and how that “ignorance” freed me to dream anything, to ask any question, to create any reality. In this paragraph, Seth’s use of “us” and “we” is inconsistent from everything else he’s written so far—prior to this paragraph, he is in the camp of the youth. Now he appears to be including himself in the camp of adults (“we’re looking for the wrong things in young people”) but then switches back to being a youth (“Our power is not in what we know…”.) Does this reveal an identity crisis? Does Seth view himself as a youth or a guiding adult, or some of both? Seth answers his own question (“What keep us from recognizing and developing the gifts of youth for benefit for all?”): older adults are looking for the old thinking answers to questions rather than hearing the questions that young adults are asking. In Seth’s view, it is the question, asked out of a lack of knowledge, that is the power of young people. Frankly, I am deeply concerned that Seth feels that the power of young people (here he seems to include himself again into this category) is not what they know, but what they don’t know. There’s a reason George Santayana wrote “Those who cannot remember the past are condemned to repeat it.” Or George Bernard Shaw: “If history repeats itself, and the unexpected always happens, how incapable must Man be of learning from experience.” Ignorance is not power. It is at best ignorance and at worst, dangerous stupidity. When Seth talked with this “expert,” is the inability “to imagine the future” the result of “knowing everything about the past” or merely an artifact of this person’s personality, or his morning breakfast? What I want to point out is the monkey that enlightened them and how. It was not the wisest nor the strongest monkey, nor the eldest who led them out every day. It was a “small monkey” – one that was probably too young or unfit to be one of the leaders. Whereas leaders tend to be at the center, holding it all together, the right question often comes from the periphery, from those on the edge who don’t fit in, who sit on the border of the unknown. Out of his ignorance (and perhaps a bit of courage) the small monkey asked the right question, the one that allowed the other monkeys to reframe their perception of the situation, and, out of this “reframing,” to change it. So, from Seth’s perspective, the point of the story is the fact that the “small monkey” (presumably young and innocent) is the one that brought new thinking to the situation. Within the context of Seth’s article, this is only half of the picture. The small monkey doesn’t just ask “can’t we take the fruits without the old man’s permission?” The small monkey first asks a question to acquire knowledge: “Did the old man plant all the fruit trees and bushes?” The small monkey still needs to learn more: “Can’t we take the fruits without the old man’s permission?” This knowledge is necessary for the small monkey to formulate the critical question that brings enlightenment to the group. It is not, as Seth writes “out of his ignorance [that] the small monkey asked the right question,” but rather out of knowledge that the small monkey builds the framework to ask the right question. I also disagree that the right question often comes “from those on the edge who don’t fit in.” I think, more accurately, the right question comes from those in the center who deeply understand an existing process. Larry Page and Sergey Brin were respectively 22 and 21 years old when they met in 1995, and a year later began collaborating on a search engine that would become Google. They met at Stanford and were both computer science graduate students. They were deeply in the center of the state of the art technology at that time. Because of their deep understanding of where the technology was, they were able to bring new ideas to the world, to ask the right questions. So how can we do the same – how can we find the new impulses and inspirations, as well as the new questions, which can lead us out of this mess? By inviting young people into the center. Not permanently (we don’t all need to be in the center all the time) but with a healthy flow. Young adults need a voice in our institutions. We do need jobs (especially jobs where we’re creatively engaged and not just wage slaves) but we also need to take on leadership roles in our communities – to join the town council or school board (these might be too boring if you just sit around reciting Robert’s Rules of Order, so check out the Art of Hosting if you want ideas of how to create a really engaging group process). We need decision-making bodies that are not only composed of the oldest and wisest (and richest) members of the community, instead we need diversity, fresh perspectives, smart answers and naïve questions. At this point, my view on the matter diverges so much from Seth’s perspective that first, I would not want to “do the same” (ask out of ignorance.) Second, the answer to “how can we find the new impulses…” is obvious—through a deep knowledge of what is and what has been. But instead, what Seth is suggesting is to bring ignorant young adults into the center (“our power is [in] what we don’t [know]”.) This is eloquently demonstrated when Seth writes “we need decision-making bodies that are not only composed of the oldest and wisest (and richest) members….,instead…” How would we complete that phrase, ending in “instead?” Like this: “instead we need the diversity…” of the youngest, dumbest, and poorest members! All joking aside, if we have naïve questions coming from the periphery by those invited to the center, then where are the smart answers coming from? Yes, from those people (young and old alike) that can bring fresh perspectives, from those people that have experienced the center and can move into the periphery. However again, a voice “in our institutions” must be earned, not through naïve questions, but by intelligent questions gained from “observe, observe, observe” that demonstrate knowledge of the box. This comes across as elitist to me—I wonder, at what point does a young adult transition from being given “everything” (by my estimates, I paid close to $100,000 for 14 years—two kindergarten years and first through twelfth grade—of Waldorf education for my son) to balancing their needs with their means–earning the “capital” that is required for their space and educational needs. The question “why aren’t schools free?” is naïve. As Nathaniel Williams writes in the article that Seth mentions, “…schools have to be funded by profits generated through the economy.” Perhaps schools can be free to students, but the school still costs something which comes from the political and economic spheres of society–spheres in which adults work. I would like to know when Seth feels a young adult should begin contributing to his/her own educational costs? When should a young adult begin contributing to the economy, so that schools can continue to be free for those that are younger? But the most interesting question for me is, if “our power is [in] what we don’t [know],” why, Seth, do you even need schools? Again, I’m not sure who the “we” is—it seems that the “we” is now people like me, who are contributing in the economic sphere, gifting to the cultural realm, etc. And what is it we’re supposed to do other than “inviting [you] into [our] organizations” and providing you with free space and education? So, once you take these suggestions and invite some punk kid on to your board, let me just remind you of one thing: you’re not the one with the answer. That kid might have the question, and you might have some good information and life experience. Mix all that together and maybe the answer is somewhere in-between, floating around in the room somewhere. But you don’t know the answer because the answer is new, it’s never been seen before. You have to find it together. It has to be done through a genuine listening-in to the future. This ain’t easy, but it has to be done. We’ve got a world to fix. Yes, we do need people with new ideas and we do need to bring together people with “good information and life experiences” together with people with new ideas, so that we can “find [the answer] together.” But do I want to invite “some punk kid” into my business? Not really. I would rather invite someone that has a grounded knowledge of my business domain, or at minimum, has demonstrated the ability to learn. A few years ago, I was invited to demonstrate some new technologies to an investment company that was looking for innovative ways to improve their software development. Along one wall there were probably 50 or so boxes labeled “Dell.” I asked what they were for, and my host replied “they’re computers because we hire about 100 Harvard and MIT students every summer as interns to teach them our business.” Yes, these were young people in what you might call an elite sector of the population—those that could afford an Ivy League education. But it’s also an elite sector of the population that qualified to go to those prestigious schools, and I imagine some of those received some scholarships. And this small company (which chartered a bus to bring its employees that lived in NYC to Stratford CT every day and hired a catering service to provide a free barbeque every Friday and had their offices in a beautiful wooded area next to hiking trails and lovely river) recognized that “the answer is new” and, even if those interns didn’t end up working for them, they were being given real world experience so that they too could one day be brought into the center.